Part of the CERRO® brand of fusible alloys by Metaconcept Group, Cerrobend is a specialty fusible alloy used widely in sectors such as aeronautics, medical and space parts. Cerrobend serves both in parts forming and temporary repair of components, in particular, for parts which pipes and form bending and setting of fragile mechanical pieces. Distributed around the globe, we can deliver to your production site thanks to our network of partners and distributors in over 50 countries. The low melting temperature (70°- 73°) of Cerrobend products is guaranteed thanks to the innovative composition of the alloy and the quality testing of solidus/liquidus points post-production.The METACONCEPT Group supplies an alloy whose performance and response to conditions match the requirements of parts and safety systems, such as in components used in radiotherapy protection shields. Available in 1kg ingot formats, we can adapt our production to create the appropriate form of Cerrobend for specific applications. We also provide a technical chart for preparation of parts for bending using our fusible alloys and we are at your disposal for presentation, training and support for your team regarding optimal use of our specialty alloy. 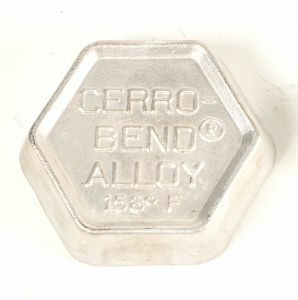 Cerrobend® are made from high quality pure metals. The bismuth-based, non-ferrous composition with low melting temperatures completes a whole range of fusible alloys of the CERRO® trademark; speak to our experts are your specific requirements and allow Metaconcept to design and manufacture a tailor-made alloy for your products. For non-ferrous alloys, Babbitt alloys, fusible alloys and fluxes used for industrial brazing and soldering, filler metals, pure metals and alloys, as well as high-tech equipment for centrifugal casting refer to the METACONCEPT Group. If you require any further information regarding Cerrobend® or our services, please contact us.